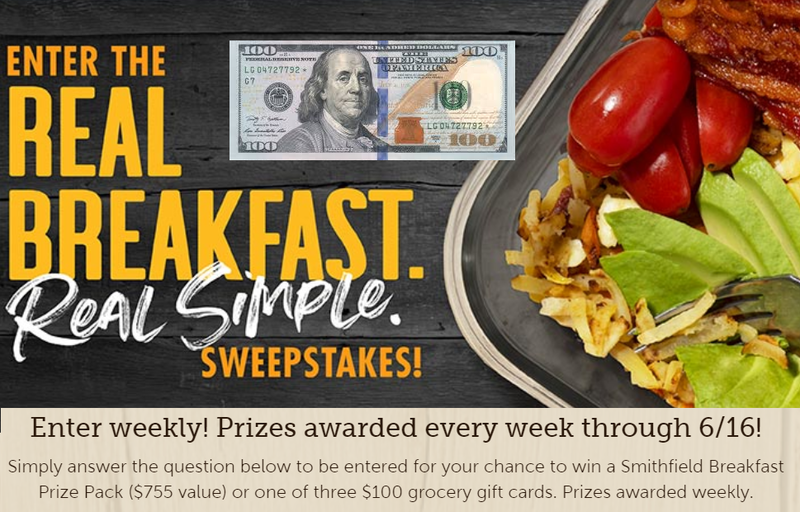 Prizes: ELEVEN (11) GRAND PRIZES: Each Grand Prize Winner will receive a Smithfield Breakfast Prize Pack containing one of each of the following: a Smithfield Bacon for a Year coupon book, a $250 Walmart® gift card, a Smithfield-branded apron, a Smithfield-branded cutting board, a Smithfield “I’m Not Bacon” t-shirt, and a set of four (4) Smithfield bacon pint glasses. Approximate Retail Value (“ARV”): $755. 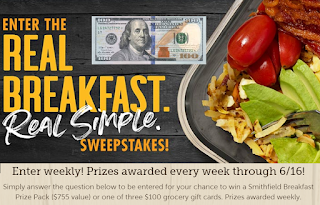 THIRTY-THREE (33) FIRST PRIZES: Each First Prize Winner will receive a $100 Walmart® gift card along with a set of four (4) Smithfield bacon pint glasses and four (4) Smithfield bacon slap koozies. Approximate Retail Value (“ARV”): $135.